Chairwoman of the WPA, Tabitha Sarabo-Halley (left) and other party executive members Dr. David Hinds and Tacuma Ogunseye. The Working People’s Alliance (WPA) on Wednesday said Dr. Rupert Roopnaraine decided on his own to stay on as a government minister despite his poor health after meeting President David Granger, but it would now be better able to influence government policies and programmes. That party believed that with improved communication and decision-making through regular meetings of A Partnership for National Unity (APNU), the WPA would be better placed to make a contribution through Cabinet. “We believe that the strengthening and the regular meeting of the APNU could qualitatively change the party’s contribution to decision-making in the Cabinet and the government as a whole,” WPA Executive member, Tacuma Ogunseye told a news conference. APNU executive, at its meeting last week Saturday, July 22, 2017 for the first time since the May 2015 general and regional elections, agreed to meet every two months, but no agenda has yet been crafted. Ogunseye said President David Granger, in his capacity as APNU Chairman, accepted full responsibility for the failure to hold meetings but the Guyanese leader gave no reasons for the hiatus. “He said he accepted responsibility for the failure of the (APNU) executive to meet regularly,” Ogunseye said. Ogunseye’s colleague executive member, Dr. David Hinds said the President was not asked to concede that he was wrong stated that the WPA was not sidelined, but has decided to set up a mechanism to address the WPA’s grievances. Hinds declined to disclose many of those grievances and the contents of the Robert Corbin report on relations and the functioning of the APNU that was discussed at last weekend’s meeting. 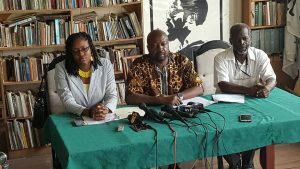 “We have to treat the Corbin Report as an internal document of the APNU and it would not be proper for we in the WPA to release the contents of the report without discussion with our colleagues so I think we cannot at this press conference go into the details of the report until the APNU discusses it and decides to make it a public document,”Ogunseye said. The WPA sought to quell disquiet in some quarters about Dr. Roopnaraine’s decision to withdraw his resignation as a minister and parliamentarian after talks with President Granger. Although the minister had told his party executive why he had decided to call it quits, WPA Chairwoman Tabitha Sarabo-Halley said Roopnaraine did not first inform the party of his decision to stay on. “Dr. Roopnaraine remains our representative in Parliament. We know that his health is not good and we defer to his judgment on his health….We leave it up to you decide whether you are well enough to continue or not. It rests with the WPA but it we defer to Dr. Roopnaraine’s judgment on his health,” said Hinds. Dr. Roopnaraine was asked by his party to stay on, according to Hinds, and would not be assessing his performance although he is the WPA’s face in government. Instead, Hinds said the party would be supporting and helping him to ensure that he performs at his optimum. The Terms of Reference for Dr. Roopnaraine are yet to be worked out. Asked whether the provision of assistance to Dr. Roopnaraine to ensure he functions effectively would not amount to additional expenses for an ill person to ensure he can function, Hinds said the minister would not be getting additional assistance. “No, he would not be getting more assistants than other ministers are getting. Ministers have a staff, they have Permanent Secretaries, all of those things and they said they would ensure that those things are in place for him so it is not about any special thing for him; at least that’s not our reading,” Hinds said. The WPA would not be drawn into concluding whether the President persuaded Dr. Roopnaraine to remain in office for fear that he could be replaced by someone who is more radical. “We don’t have any evidence of that. We have heard that in the wider society and people are free to make their judgment one way or the other but we have not arrived at that position within the party,” Hinds said. Dr. Roopnaraine was removed from the post of Minister of Education for apparent poor performance and subsequently offered to be Minister of the Public Service.